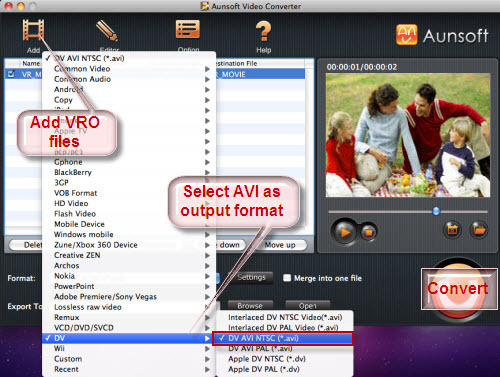 Now I think you exactly need a professional and powerful VRO to AVI converter for Mac - Aunsoft Video Converter for Mac which is good at converting VRO to AVI for Kdenlive and Adobe Premiere with high quality and perfect synchronization of audio and video on iMac, MacBook, Mac Pro, etc. Follow is the guide for telling you how to process it. First of all, please connect your camera with your Mac, and then please choose to copy VRO files to Mac, you better be. Step-by-Step Guide: Convert VRO to AVI with Aunsoft VRO to AVI Converter. Step 1: Download, install and launch Mac VRO to Kdenlive/Adobe Premiere AVI Converter. Step 2: Add your VRO files, select output format AVI, DV-AVI and specify destination folder. Click “Add” to load VRO files to this program, or just by dragging-and-dropping method. Then hit the drop-down list of “Format” to select a Kdenlive and Adobe Premiere workable format AVI, DV-AVI. After that, you need to click “Browse” to point out where to save the output files, if not, they will be stored by default. Tip: If you want to join multiple VRO files together to be a single one, you can click “Merge into one file” to achieve it. Personally I like to check it. Step 3: Set advanced settings. You can get the following interface by clicking button “Settings”. In this window, you are permitted to adjust video and audio parameters such as codec name, screen size, bit rate, frame rate, etc. Like keep resolution 1080i, 1080P, 720P, Audio AAC, AC3, 5.1 channel etc. Step 4: Convert VRO to AVI, DV-AVI for Kdenlive and Adobe Premiere on Mac. Once the former three steps have been finished, you can click “Convert” to start converting your VRO files to AVI for Kdenlive and Adobe Premiere Pro. So easy, all the processes can be completed within a few clicks of your mouse. After that, you can click “Open” in the interface of Aunsoft Mac VRO Video Converter to find out the output files, and add them to Kdenlive or Premiere for editing. Tip: Kdenlive (KDE Non-Linear Video Editor) is a non-linear video editor based on the MLT Framework that focuses on flexibility and ease of use. The project was initially started by Jason Wood in 2002, and it is now maintained by a small team of developers. Kdenlive supports all of the formats supported by FFmpeg (such as QuickTime, AVI, WMV, MPEG, and Flash Video), and also supports 4:3 and 16:9 aspect ratios for both PAL, NTSC and various HD standards, including HDV. Video can also be exported to DV devices, or written to a DVD with chapters and a simple menu.